Food by Fire was started in 2000 when the owner had such a blast providing the food for a civil war weekend at his church that a catering service was born. With just a few events over the summers for the first couple of years, Food by Fire has grown since then into a full service source for bull and oyster roasts, pig roasts, company picnics, family reunions, fund raisers: all sorts of events public and private. Our philosophy is to add to your good time. Whether it is a company thank-you party, a public fair or neighborhood block party, mom's 80th birthday or a political bull roast our task is to take the worry out of whether the food will be good, will your guests like it, will there be enough. 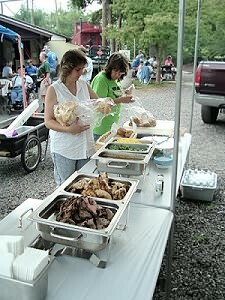 We have produced events at many public central Maryland locations including: Oregon Ridge Park, Patapsco State Park, the Maryland Agricultural Center, volunteer fire halls such as Hereford, Kingsville and Cockeysville, Rocks State Park, Baltimore's Best Party Center, as well as too many back yards, farms and parking lots to list. Let us add your venue to our list!